In this Power Query (Get & Transform) Tutorial for beginners, you learn how to use Power Query (Get & Transform) to automate the process of importing and consolidating data in Excel. What Power Query is and how it can help you. What data sources can Power Query import data from. How to import single or multiple data sources from an Excel workbook. How to import data from CSV or text files. How to edit a query during the process of importing data with Power Query. Where and how to load the data you import with Power Query. How to combine and consolidate the data you import from different files with Power Query. This Power Query Tutorial is accompanied by several example files containing the data, queries and connections I use in the examples below. You can get immediate free access to these example files by subscribing to the Power Spreadsheets Newsletter. Alternatively, you can access all the files that accompany my Tutorials here. This Power Query Tutorial was most recently updated in March 2018 with Excel Version 1802 (Build 9029.2253 Click-to-Run). Microsoft is constantly updating/modifying Power Query. If you're working with a different version of Excel/Power Query, some details (particularly menus) are different. The principles and basic processes you learn in this Power Query Tutorial, are generally applicable. Learn how to work with keyboard shortcuts here. Learn 350+ Excel keyboard shortcuts here. Learn several ways to convert PDF files to Excel here. Learn the basics of cleaning data by working with Text functions here. Learn the basics of working with macros here. Learn about basic VBA constructs here. Learn how to convert PDF files to Excel with VBA here. You can find additional Tutorials in the Archives. One of the first steps in the process of analyzing data in Excel is importing it. You can achieve this in several ways. Common approaches involve manually importing data or using VBA to automate the process. These approaches may not be the most appropriate in several cases. The process of manually importing data into Excel is generally slow, repetitive, tedious and error-prone. Macros and VBA can help you automate a lot of your data importing processes. This approach, however, requires some programming knowledge and, depending on your situation, you may need to spend time maintaining the procedures you use. Like VBA, Power Query allows you to automate the process of importing data. However, when compared with VBA, Power Query is generally easier to work with and maintain. Power Query also tends to result in better performance (vs. VBA). 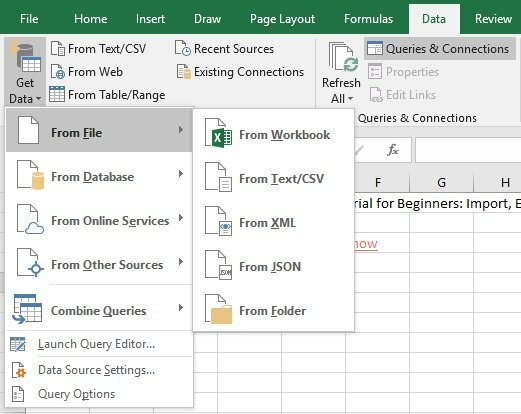 Extract: Use Power Query to discover and connect to a variety of data sources. Transform: Transform the extracted data by, for example, combining or refining it. Load: Share the transformed data. Files: Excel files, Text or CSV files, XML files, and JSON files. Databases: Microsoft SQL Server, Microsoft Access, SQL Server Analysis Services. Other example data sources: Microsoft Exchange, Facebook, SalesForce, Excel Tables or named ranges, web pages, and OData feeds. Each line within the file is a row of data. Columns are determined by the appropriate delimiter (for example, comma in CSV files or tab in tab-delimited files). You can access the example files that accompany this Power Query Tutorial by subscribing to the Power Spreadsheets Newsletter. Date: Between January 1 of 2018 and December 31 of 2019. Store: I assume there's 1 store per city listed below. I divide the cities in 4 regions (Midwest, Northeast, South and West). The source files contain 20,000 rows of data for each region. Midwest: Chicago, Detroit and Minneapolis. Northeast: Boston, New York and Philadelphia. South: Atlanta, Dallas, Houston, Miami, Tampa and Washington D.C.
West: Los Angeles, Phoenix, San Diego, San Francisco and Seattle. Units sold: Between 1 and 5. Total sales: The product of units sold times unit price (UnitsSold x UnitPrice). The following are the differences between the different source file examples. The Midwest source data is formatted as an Excel Table (myTableSource). The cell range containing the Northeast source data is a named cell range (myNamedRangeSource). CSV: The CSV file examples only has data corresponding to the South region. This is the same data as that in the South worksheet of the example workbook. Text: This is a tab-delimited text file containing (only) data corresponding to the West region. This is the same data as that in the West worksheet of the example workbook. The source data isn't formatted. Further below, I explain how you can use Power Query to format the data. If you use the file examples that accompany this Power Query Tutorial, you can't simply refresh the data extracted by Power Query from the main workbook (which has the queries and connections). The path of the source files you download will be different from the one I specified in the workbook example. The result is a data source error. Therefore, I suggest you recreate the queries yourself by following the step-by-step processes I describe below. In the following sections, I explain the basic process you can follow to import data from an Excel workbook, CSV or text file using Power Query. The essential steps are similar. Power Query has several options and features you can use while importing data. However, these topics exceed the scope of this Power Query Tutorial for beginners. Go to Ribbon > Data > Get Data > From File > From Workbook. Power Query displays the Import Data dialog box. Identify the source workbook and double-click on it. Power Query displays the Navigator dialog box. Select the data source you want to work with. The following GIF illustrates the process to import a single data source from an Excel workbook with Power Query. Select the data sources you want to work with. The following GIF illustrates the process to import data from multiple data sources in a workbook with Power Query. Go to Ribbon > Data > Get Data > From Text/CSV. Identify the source CSV file and double-click on it. Power Query displays a dialog box named after the CSV file. The following GIF illustrates the process to import data from a CSV file with Power Query. Identify the source text file and double-click on it. Power Query displays a dialog box named after the text file. The following GIF illustrates the process to import data from a text file with Power Query. Use the keyboard shortcut “Alt, A, PN, F, W”. Use the keyboard shortcut “Alt, A, FT”. Browse to the folder where the file (workbook, CSV or text) is saved. Double-click on the appropriate file. The Import Data dialog box usually displays any type of Excel file. This includes, for example, regular Excel workbooks, templates and macro-enabled workbooks. Regardless of the precise Excel file type you work with, Power Query limits itself to working with data in cells. Therefore, items such as PivotTables, charts or macros aren't imported. When you work with a CSV file: The Import Data dialog box displays only CSV files. When you work with a text file: The Import Data dialog box displays only text files. Right bottom: Load, Edit and Cancel buttons. On the left side of the Navigator dialog box, Power Query lists the data sources you can select inside the workbook you're working with (selected with the Import Data dialog box). A named range. It's possible to connect Power Query to, for example, dynamic named ranges. The process to work with this type of named range, however, differs from what I describe in this Power Query Tutorial. You can distinguish these different data sources based on the icon displayed by Power Query next to the source. Mark the checkbox next to “Select multiple items” on the top left side of the Navigator dialog box prior to selecting the data sources. Once you enable the option to select multiple items, Power Query displays checkboxes to the left of all data sources in the workbook. Use these checkboxes to select all the data sources you want to import. Once you select a data source from the list of available data sources, Power Query displays a preview of the data. Use this preview to confirm that the source data you chose is correct. Load: Load the data. You can specify how and where the data is loaded by following the process I describe further below. Edit: Launch the Query Editor and edit your query. You learn the basics of working with the Query Editor further below. Cancel: Close the dialog box and cancel the process of importing data with Power Query. Bottom: Load, Edit and Cancel buttons. The main difference between this dialog box and the Navigator dialog box (in a previous section) is the fact that the Navigator dialog box allows you to choose from the available data sources within a workbook. CSV and text files contain text data only. You don't have named ranges, Excel Tables, nor multiple worksheets to choose from. Therefore, when importing data from a CSV or text file, you don't select a data source within the file. A single data source from a workbook. Loads the imported data to an Excel Table in a new worksheet. Displays the Queries & Connections task pane. This task pane includes the query you just created. Loads the imported data to the Data Model. Displays the Queries & Connections task pane. This task pane has separate queries for each data source you selected. Power Query has several features that allow you to edit queries. This section introduces the topic. However, covering all options exceeds the scope of this Power Query Tutorial. The processes I explain below build on the basic procedures to import data (from workbooks, CSV and text files) I explain in previous sections. Please refer to those sections as needed. Power Query launches the Query Editor. Go to Ribbon > Home > Close & Load. The following GIF illustrates the process to edit a query when importing data from a workbook with Power Query. In this example, I set the data type of the first column as Date by following the process I describe further below. The following GIF illustrates the process to edit a query when importing data from a CSV file with Power Query. In this example, I set the data type of the first column as Date by following the process I describe further below. The following GIF illustrates the process to edit a query when importing data from a text file with Power Query. In this example, I set the data type of the first column as Date by following the process I describe further below. You begin the process of editing a query with Power Query by clicking on the Edit button on the bottom right section of the appropriate dialog box. You use the Query Editor to edit your data prior to completing the import process with Power Query. Covering all the edition possibilities you have exceeds the scope of this Power Query Tutorial. Determine the elements of the source data you work with. This usually involves working with the columns displayed in the Preview pane of the Query Editor. Carry out the editions that are required to shape, clean and transform the source data into the data you need. In this Power Query Tutorial, I cover a single query edition: Setting a column's data type. Click on the column whose data type you want to set. Go to Ribbon > Home > Data Type. Right-click on the column header and, in the context menu, go to Change Type. This is the process I follow in the example below. Add the new conversion as a separate step. The following GIF illustrates the process to set a column's data type as Date. In some cases, such as when working with international date and number formats, you may have to carry out additional steps. For example, when I apply the process above to the CSV or text file source data examples, the Query Editor returns errors. Right-click on the column header and, in the context menu, go to Change Type > Using Locale. The Query Editor displays the Change Type with Locale dialog box. Select the appropriate data type and locale using the drop-down lists in the Change Type with Locale dialog box. The following GIF illustrates the process to set a column's data type as Date using Locale (German). The results of importing data and editing a query with Power Query are similar to those of just importing data (without editing the query). Loads the imported data to a new worksheet. Displays the Queries & Connections task pane. This task pane has separate queries for each data source. If you load data from a single data source in a workbook, or a CSV or text file: Power Query loads the data to a new worksheet. If you load data from multiple data sources in a workbook: Power Query loads the data to the Data Model. The Navigator dialog box (when working with an Excel workbook) or the dialog box named after the source CSV or text file (when working with a CSV or text file). Go to Load > Load To. Select the loading settings you want to apply. I explain how you work with the Import Data dialog box below. I work with a CSV file. Instead of loading the imported data to a worksheet (the default), I only create the connection. Go to Home > Close & Load > Close & Load To. I work with a text file. How you view the imported data in the Excel workbook. As a Pivot Table Report. Where (in the Excel workbook) is the data loaded. Whether the data is added to the Data Model. Loads the imported data according to the settings you specify in the Load To dialog box. Displays the Queries & Connections task pane. This task pane includes the query/queries you just created. In the examples above, I only created a connection. Therefore, the imported data isn't loaded to a worksheet. The queries, however, are displayed in the Queries & Connections task pane. Append data to an existing query. You combine or consolidate data imported from different files with the Append feature of Power Query. When you append data, you add the entries from 1 table to the end of another table. This results in a single table that combines or consolidates different sources of data. Create individual queries for each data source. Go to Ribbon > Data > Get Data > Combine Queries > Append. Excel displays the Append dialog box. Select the number of tables to append and the tables to append. Excel launches the Query Editor. The following GIF illustrates the process to combine data imported from different files by creating a new query. Go to Ribbon > Data > Queries & Connections. Go to the Queries & Connections task pane and right-click on the first query you want to combine. Select Edit in the context menu displayed by Excel. Go to the Query Editor Ribbon > Home > Append Queries. The following GIF illustrates the process to combine data imported from different files by appending data to an existing query. The Append feature generally works with existing queries. Therefore, you must usually go through the process of creating the appropriate queries prior to combining or consolidating the data from different sources. To learn how to create a query, please refer to the appropriate sections in this Power Query Tutorial. Use the keyboard shortcut “Alt, A, PN, Q, A”. Use the keyboard shortcut “Alt, A, O”. When you append data to an existing query, you identify the first query you want to combine in the Queries & Connections task pane. This step is important because, after you complete the process of combining imported data from different files by appending data to an existing query, the query you select in the Queries & Connections task pane contains the data from all the queries you're combining. The number of tables to combine. The tables that Power Query appends. The Append dialog box looks different depending on whether you're creating a new query or appending data to an existing query. Specify the number of tables to append. Specify the tables that are appended. Click OK on the lower right corner of the Append dialog box. To specify the number of tables to append, select the appropriate option (Two tables, or Three or more tables) at the top of the Append dialog box. When you create a new query by appending 2 tables, use the 2 drop-down lists (Primary table and Table to append to the primary table) to select the tables to append. Available table(s) list box: Lists the queries in the workbook you're working with. Tables to append list box: Lists the queries to be combined. Click Add>> to add a table from the Available table(s) list box to the Tables to append list box. Add>> is only enabled if a table in the Available table(s) list box is currently selected. Click the Up or Down Arrow to modify the order of the tables in the Tables to append list box. This determines the order in which the data is displayed in the output. Arrows are only enabled if: (i) a table in the Tables to append list box is selected; and (ii) there are at least 2 tables in the Tables to append list box. Click Delete to delete a table from the Tables to append list box. Delete is only enabled if a table in the Tables to append list box is selected. Select the table to append in the Available table(s) list box. Repeat steps #1 and #2 for each individual table you want to append. When you append a table to an existing query, use the Table to append drop-down list to select the table to append. The first table (that to which the table you select is appended) is the one you select in the Queries & Connections task pane at the beginning of the process. Power Query identifies this table by adding “(Current)” to the label. Theoretically, you can select the table labeled as (Current) in the Table to append drop-down list. This, however, results in appending a table to itself and duplicating all records. Lists the queries in the workbook you're working with. Power Query identifies the first table (that to which tables are appended) by adding “(Current)” to the label. Lists the queries to be combined. The first table (that to which tables are appended) is already displayed in this list box. Power Query identifies this table by adding “(Current)” to the label. Add>> is only enabled if the Available table(s) list box is currently selected. Arrows are only enabled if: (i) a table (other than the (Current) table) in the Tables to append list box is selected; and (ii) there are at least 3 tables (the (Current) table + 2 other tables) in the Tables to append list box. Delete is only enabled if a table (other than the (Current) table) in the Tables to append list box is selected. Repeat steps #1 and #2 for each individual table you want to append to the existing query. Theoretically, you can add the table labeled as (Current) to the Tables to append list box. This, however, results in appending a table to itself and duplicating all records. The results of combining the data you import from different files depend on whether you create a new query or append data to an existing query. Loads the imported data to the worksheet containing the existing query you started with ((select at the beginning of the process). Continues to display the Queries & Connections task pane. In this case, the query you start with contains the combined data from all the tables you appended. You can get immediate free access to the example files that accompany this Power Query Tutorial by subscribing to the Power Spreadsheets Newsletter. Introduction to Microsoft Power Query for Excel. Power Query – Overview and Learning. Get & Transform in Excel 2016. Getting Started with Power Query. Getting Started with Get & Transform in Excel 2016. Import data from external data sources (Power Query). Connect to an Excel or CSV file (Power Query). Connect to an Excel table or range (Power Query). Import or export text (.txt or .csv) files. Shape or transform a query (Power Query). Combine data from multiple data sources (Power Query). Combine multiple queries (Power Query). Excel Power Pivot & Power Query for Dummies by Rob Collie and Avichal Singh. M is for (Data) Monkey: A Guide to the M Language in Excel Power Query by Ken Puls and Miguel Escobar. Power Query for Power BI and Excel by Chris Webb. Power Pivot and Power BI: The Excel User's Guide to DAX, Power Query, Power BI & Power Pivot in Excel 2010-2016 by Michael Alexander.